Did you finally get it? I’m about to take the plunge for a couple of these and would go for the new comms version if I were sure that opendps would work with it. I received it this week but have not had time to flash it yet. Hopefully any day now. OpenDPS is now compatible with the DPS5005 “communications version”. A new bootloader removes the requirement for permanent JTAG. I would like to ask for your help. I got a 5005 power supply module that got a bit of surge and it broke. The “F3” mark on one of the pictograms was split in. I found one half of it and managed to find a similar one in the other part of the panel I tagged in the other picture. Can you tell me what kind of part it is and what can I replace it for? Hi Robert. Ouch, that must have been some power surge for components to crack. F1 could be a ferrite bead but that is only a guess. Unfortunately chances are other components got fried. You could always test short circuiting the F1 pads. Interesting. None of my ‘5005s look like that. You seem to have a revision between the one I have in the original post and the comms version. Order a 1206 2A fuse from a suitable distributor depending on you location and do some soldering. Hopefully it sorts things out. Good luck! Ok. I try. Thanks a lot. Silly me, it’s a fuse of course 😉 It looks like a 1206 size, I will check my DPS and see if I can determine the rating. Do you know if OpenDPS works with the DPS5015? I’m guessing the model number is different on RD’s AliExpress site because they are including a 15A supply. Did you managed to update your 5015? I also got one PCB V2.2. Please advise who managed to update the board correctly. Also, will the PC software work with the open source? Anyone know what the real serial protocol is on the “communications version”? It looks like RD’s GUI front end is just filling information found from that protocol. So anything might control the board? Not just their GUI. The protocol is called “modbus”. You can find some basic info on http://ls-homeprojects.co.uk/dps3005-psu-module-and-modbus-rtu-python-arduino/ (hope it is ok to post a link to another page). There is a description of the communication protocol on https://www.mediafire.com/folder/3iogirsx1s0vp/DPS_communication_upper_computer. It’s in chinese but with help from google translate and the basics found on ls-homeprojects i was able to control and monitor the DPS with a simple python script under linux. Thanks for the information. I thought it would be SCPI though. I wonder if the stock firmware version on the modules is still different between comm and no-comm hardware. I am planning to remote control the module(s) exclusively via esp8266 so I actually do not need any usb-to-serial or bt-to-serial converter. Maybe we should suggest to sell a new bundle with just the module and a jst-to-dupont-cable to the manufacturer. Dude, let me tell you that your work is superb. Thank you! Just a question: do you know if the DPH3205 (the buck/boost version) is also compatible with this software? Did anyone else tell if it is compatible? Gee, thanks! I don’t know about the ‘3205 but adding support should be quite easy. If I buy it, I’ll definitely try to reverse engineer it. I have just connect a Bluetooth module to my DPS5005 and it works fine using the “DPS5005 PC Software v1.3”. Bluetooth module must have been set to 9600 baud rate (8 bits, no parity). Is it really 1mm (JST-SH)? Mine is 1.25mm (JST-GH). On a DPS5005 bought end of July, I use a 1.0mm connector. Great work Johan and a great read. Thanks for all your effort. The rest of the posters as well. I have a DPS3005C on order, so it comes with a USB2TTL bridge and a BLUETOOTH bridge. I have not had a chance to look at the source code for OpenDPS. I have the STM32 support tools and the ST-LINKv2 programmer as well. Could you verify if OpenDPS supports the DPS3005? Hi Johnny. I can offer no guarantees as I have no DPS3005C but I do have a fully supported DPS5005C. I would be very surprised if its sibling was not supported. I just started to catch all available information on these modules. According to the translated comspecs there is a “slave-address” (always set to 01H) for addressing different devices on the same bus. Is the module capable to set different adresses with the stock firmware and/or Open-DPS? Hi Steve. I am not sure what bus you are referring to. 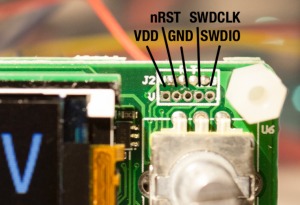 Both the stock FW and OpenDPS uses a serial protocol over a point to point UART. Still, you could build something with an eg. STM32 with three UARTs connected to each DPS. Modbus RTU can talk to multiple devices on the same serial bus. If you could add the functionality to change the Modbus address in your firmware, multiple units can be accessed from one serial bus. I received the DPS3005C and case today. No instructions on the case component assembly but it came together just fine. I ended up connecting all 5 pins, nRST and 3.3V VDD and still no joy. Any recommendations? Hi Johnny. That sounds strange. The only things I can think of are the connection (there are two different pinouts on the ST Link v2 clones), a non powered DPS (the ST Link cannot power the CPU on the DPS) or a locked SWD port in newer DPS:es (_really_ hoping this is not the case). thank you for doing all this work and sharing this awesome piece of info! I have, or so it seems, managed to mess up the software (or the whole thing all together) on my DPS5005 comm version. Therefore I decided to cut the connector and just use the cables without the connector, but when I tried to use the ESP again, it seemed to kill my DPS! 🙁 No idea how, but I ended up with only a black screen and no output… I seriously doubt that I managed to totally kill it… I mean, there’s still 3.3V on VCC pin of the JST socket, haha. And could OpenDPS still be installed over the broken firmware in order to save the DPS ? Thanks! The DPS seems quite sturdy from an electrical point of view, I have mishandled mine on several occasions without killing it. Do you get any voltage output if you press the enable button? OpenDPS would probably not save your DPS since I cannot think of a way the firmware could get damaged by this (as opposed to the STM32 micro controller). Currently, no. Given a protocol specification of the PC software this would be doable though. I don’t have my unit yet, but can sniff and attempt to decode the Tx/Rx traffic once it shows up. Is it safe to assume that it would be vanilla Modbus passing back and forth between the PC and the unit over serial? The original firmware uses modbus for comms. For a GUI alternative based on python I put together this over the past few weeks. Thanks, I’ll check your GUI out. thanks for you great effort… looking forward building my own power supply soon. 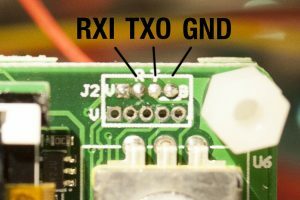 a) how do you power the esp8266? Is the VCC from the 5005 3V3 and enough power? Or do you prefer a separate power supply? b) @jonny quest: any luck with the 3005? or anybody else? I only use 24V power supply, so I would go with the 3005 instead of the 5005 (if coompatible). thx for the reply… I ordered already a 5005… just to be on the safe side. only problem left is how to power the esp8266 with 3v3? 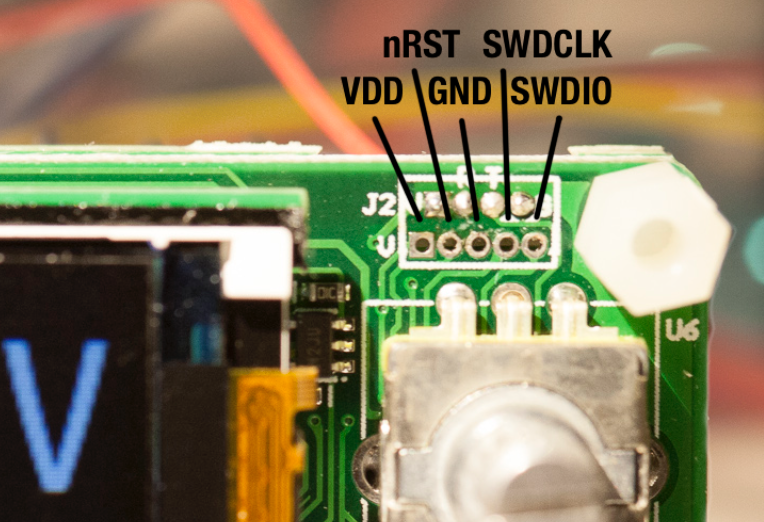 I believe, although I have not checked, that there is 3.3 volts at the “VDD” pin on the JTAG connector. I was able to solder a wire pigtail to the JTAG connector on my DPS3005. 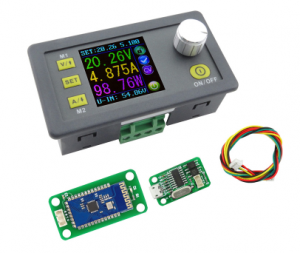 These units use an STM32 uC, which requires a 3.3 volt power supply. If nothing else, Use a buck DC-DC converter to step the input supply down to 3.3 volts. If you ordered the aluminum case for your power supply, then there is a 5 volt fan attached to the rear of the case. There is a PCB that attaches across the input jacks that is a 5 volt DC-DC step down converter, so you could tap off the 5 volts and tun it into a 3.3 volt LDO regulator. 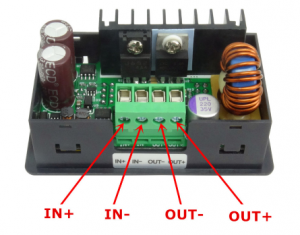 Great writeup about the fan controller. I cannot help you with the original firmware but my DPS-SWD-BTL could probably be useful. Thank you for the compliment on the AVR Fan controller. I wanted to document the fan noise and had to find an SPL meter, which I ordered. I also recently found several ANDROID apps that accomplish the same task but without an accurate sound pressure source, I cannot verify the accuracy of the readings. The various ANDROID apps seem to give different readings as well, some off by as much as 20 dbA. Wowzers Bandit! That’ll much difference give you a black eye! I’m not familiar with the “DPS-SWD-BTL”. What is it and where do I find it? I neatly looked at the my board and the circuits, I downloaded the opendps. I looked at the source code of opendps. the hardware is identical (i think, it’s magick) up to voltage/current dividers constants. I read the source code. all points in 3205 correspond to points in 5005, but the parameters of voltage/source dividers/multipliers are not. I upload the firmware (opendps) to my dp_h_3205 and it worked! (with minor errors). errors is only in voltage/current set/seek scale. I think that errors are only in dps-model.h (this file cjntains constants for scale the target, source, etc voltages and currents), in this file are the division and multiplication constants for scale check/set voltage/current. How to choose those constants that need to be changed in dps-model.h? I can set the current and voltage (in GUI), setup the load (for example, resistor or light bumb with non-linear I(U)), add volt-meter and amper-meter, check the real (and setupped) voltage and current. how to calculate A_ADC_x and V_DAC_x values separately? with best regards, Nickita A. Startcev.